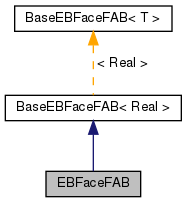 EBFaceFAB is a BaseEBFaceFAB<Real> which includes arithmetic functions. Returns the maximum value for the given component in the FAB. Returns the minimum value for the given component in the FAB. Reimplemented from BaseEBFaceFAB< T >. Both fabs need the same ebisBox and region and number of components.